ALEXANDER, Sir WILLIAM, the younger, eldest son of Sir William Alexander, Earl of Stirling, founder of a Scottish colony at Port-Royal (Annapolis Royal, N.S. ); b. c. 1602; d. 18 May 1638. On 4 Feb. 1628/29 Alexander, the Kirkes, and others obtained a monopoly of the trade to Canada. 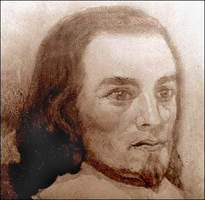 While the Kirkes went off to capture Quebec, Alexander joined forces with Sir James Stewart, Lord Ochiltree, helped him build a fort at Port de la Baleine (now Baleine) in Cape Breton, and then, under the guidance of Claude de Saint-Étienne de La Tour, proceeded to Port-Royal. Here, in the summer of 1629, Alexander built a new fort in which he decided to pass the winter, sending back his ship for additional supplies and colonists. He also dispatched Claude de La Tour with an agreement for his father, Sir William, to sign, the terms of which conferred the title of knight-baronet and a large grant of land on Claude and his son Charles de Saint-Étienne de La Tour, in return for their assistance and allegiance. This agreement, slightly modified, was duly signed by Alexander’s father 30 April 1630. However, when Sir William returned to London that autumn, leaving Sir George Home in charge at Port-Royal, he reported that half the colonists had died during the previous winter. Claude de La Tour, moreover, having been unable to win over his son to the British cause, had lost the support of the Scots at Port-Royal, and had been induced by his son to return to his former French allegiance. 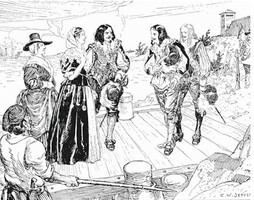 Finding that Charles I was about to surrender the colony, Sir William did not return to Port-Royal. After the Treaty of Saint-Germain-en-Laye in 1632, the Scottish colony came to an end and the colonists were transported to England in the Saint-Jean, one of the ships which had brought Isaac de Razilly and French colonists to repossess Port-Royal. Alexander continued for the rest of his life to be the loyal support of his father. In 1635 he was admitted as one of the extraordinary lords of the session, following his father’s resignation, and in the same year he was appointed a member of the council of the New England company. 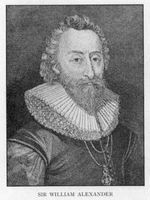 In 1637 he was made deputy secretary of state for Scotland, with a salary of £300 per annum. Unlike his father, however, he was solvent at the time of his death, which occurred suddenly in London, 18 May 1638. He left only one son, a child of six, who, two years later, enjoyed for a few brief months the title and estates of his grandfather, the Earl of Stirling. In addition to the references under Sir William Alexander, Earl of Stirling, see Couillard Després, Saint-Étienne de La Tour. D. C. Harvey, “ALEXANDER, SIR WILLIAM,” in Dictionary of Canadian Biography, vol. 1, University of Toronto/Université Laval, 2003–, accessed April 20, 2019, http://www.biographi.ca/en/bio/alexander_william_1602_1638_1E.html.